Two years ago, I wrote about unboxing a Vibiemme espresso machine, which you can read here. And now, the machine which is produced under the same brand but equipped with more features and called as Vibiemme Double Domobar Manual Stainless Version 3 is going to be a permanent resident at my crib. Just think of it as a present from Vibiemme Italy and its Indonesian distributor, Toffin, for Cikopi.com’s fourth year anniversary! Image 2: The Whole Package. 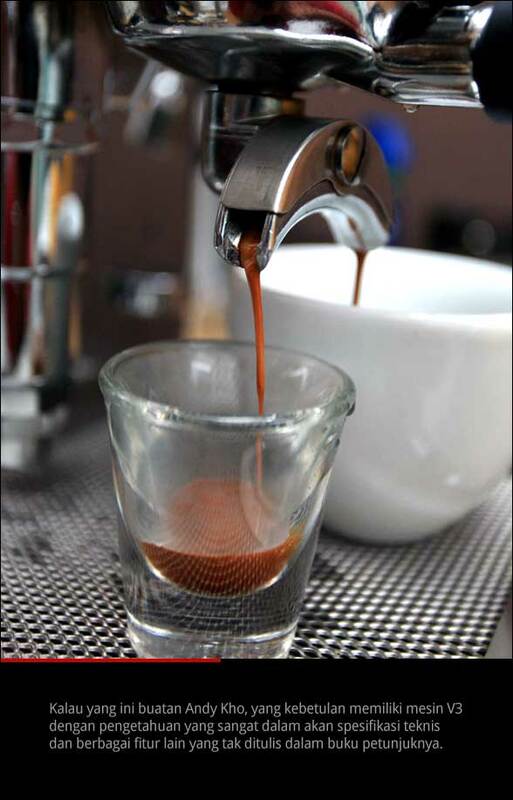 Single and double portafilters, a blind filter, a plastic tamper, a cleaning brush, a coffee spoon and a manual. There’s also a flexi pipe to connect the machine to a water supply, and a hose for water waste. This is the third version of Vibiemme, when previously it has released similar types of machines that I’ve reviewed, titled Domobar PID & Double Boiler. So I won’t bother you with too many unnecessary details, except for the significant differences such as the changes in its pump, which previously worked using a vibration method, and now has been modified into rotary instead, as what you can find on any commercial machines. 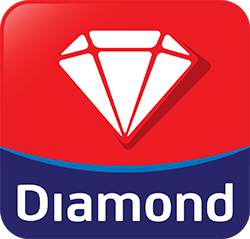 Other upgrades include its ability to choose its water tank or water supply by using a lever on the bottom of the machine. Vibiemme also claims an important improvement on the consistency of the boiler temperature and a steamer that is more powerful than its predecessor. Engineering and Design Aspects. Vibiemme’s exterior design, which is intended for home appliance or light commercial use, has not changed a lot since it was first released in the 80s. Made of shiny stainless steel with a legendary E61 grouphead, its classic look still remains a favorite to its fans. Look at the curves on its surface, from top to bottom, you can see that Vibiemme pays a lot of attention to details, making it one of those machines that will remain famous in the world of espresso machines. One thing that needs to be considered is even though a stainless surface looks prestigious; it requires a lot of attention to keep it that way. Overlooked water droplets can quickly stain and create dull spots on its surface – think about maintaining the surface of a car in metallic black and you’ll know how much of a pain it can be. If you can’t be bothered to polish it regularly using a micro fiber rag, dirt and droplets will soon become permanent decorations of the exterior. The Package: Inside the cardboard, you’ll find a single and a double portafilter, a blind filter for backflushing, a cleaning brush, a plastic tamper, a manual and hoses for water supply distribution and waste. As usual, the plastic tamper is merely a formality, so to tamper coffee on a 58 mm portafilter, use an aluminum or stainless one instead. Electricity power: Lifting a machine that weighs around 31 kg in total requires the ability of two grown men, and the machine must be placed on an even and strong surface. The length reaches 53 cm and its width is 27 cm, with the height of 42 cm and takes up the total power of 2100 watt which is divided for brewing (which takes up 900 watt) and steaming (which takes up 1100 watt). 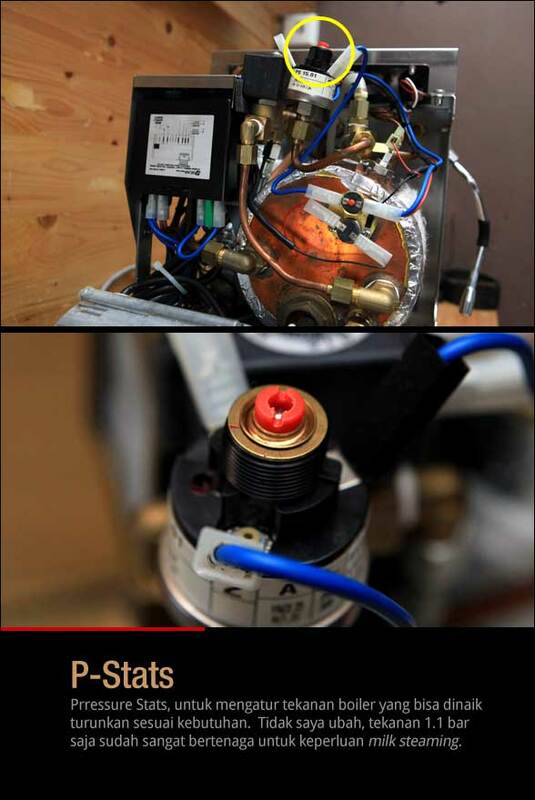 Power source can be an obstacle for any home barista, who usually has to supply an extra power source to meet the machine’s needs. The good thing about this machine is that it doesn’t use a 3-phase system, so your home electricity can be fairly distributed with a miniature circuit breaker or MCB. As a side note, the large electricity power on this machine requires prime quality electricity outlets or power supply which is necessary for safety and short-circuit prevention. Water tank: The machine cover can be opened and closed to access the 1.8 liter water tank which has a small hole to adjust the Pressure Stats using a flat-blade screwdriver. The water tank can also be detached not only for easy refilling, but also quite handy should you need to change the water supply to direct plumbing, which can be tightened using a Phillips screwdriver. Tightening the screws is meant as a bypass, so that the automatic shutdown feature, so in case the water tank is empty, the machine automatically turns of its electrical flow to protect itself from any heat from the boiler due to insufficient water supply. If you’re using other brands who do not have this feature, it is advised that you check the water supply frequently so fatal damage on important parts – such as the heating element – can be avoided. When closed, the top part can be used to store or warm up your coffee cups, and this is done by using the heat from the boiler. As an additional feature, some double grouped commercial machines use an activated warming system which is basically a heating element placed on the cover’s surface – like Vibiemme Lollo, for example. It’s a useful feature nonetheless, since it’s advisable that you keep your cups warm, to prevent the coffee’s temperature dropping drastically due to any contact with cold equipment. The Front Panel: Two manometers show the boiler pressure indicator (on the left) and the pump’s (on the right), which are important to monitor while brewing. The manual does not tell you exactly how much is the pressure for the pump and the boiler, but on the previous machine I used, 8.6 to 9.2 bars for the pump pressure is the safe range, as advised by the manufacturer. There’s a steam wand on the right hand side, and a movable steam with two holes – each has 1 mm diameter – are placed on the left. 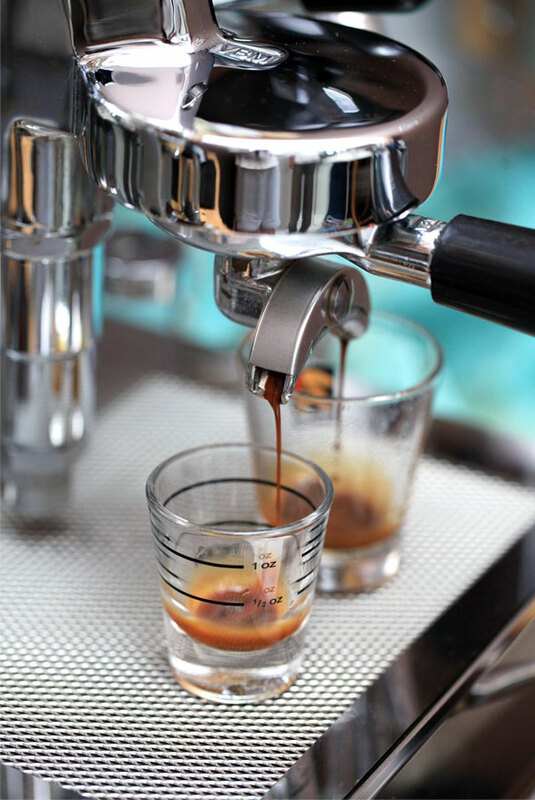 The steam wand produces heat when the machine is operated because it’s not equipped with an anti-burn feature. You can find the hot water lever on the right hand side, which I rarely use. The Manometer. On the left is a gauge for boiler pressure and on the right is a pump pressure indicator. I set the boiler pressure to 1.1 and to a maximum 1.5 bar, and 9 bar for brewing. Double boilers and a rotary pump: This third version of Vibiemme is equipped with two 500 ml boilers to brew coffee, and 1.9 liter for steaming purposes. The boiler is specially coated to keep the water temperature stable. The rotary pump is attached on the back of the boiler – a common feature for commercial, double-grouped machines. In the manual, it says that the pump is not designed to support water that flows against gravity – so basically, you need to use an additional pump – like a flo jet – if you want to utilize a water gallon under the cabinet. The Cup Warmer. With the dimension of 26 x 25 cm, it’s enough to warm several cups, as pictured above. PID: This is the selling point for Vibiemme V3. PID is an abbreviation for Proportional, Integral and Derivative; it allows brewing temperature setting to accommodate the operator’s needs. 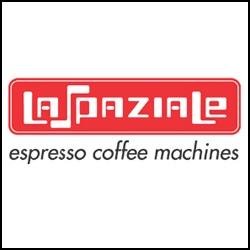 The temperature parameter is adjustable – Celsius or Fahrenheit – by pressing both buttons when the machine is off. While both are pressed, turn the switch to the “I” position so the display shows “F.03”, and then release them. Adjust the “C” or the “F” by pressing the button on the right hand side, and when you’re done, turn the machine off to execute the command, and then turn it back on. The PID feature is adjustable to even the lowest temperature, which is 80°C to the highest, which is 125°C. So what is the ideal brewing temperature? For me, 95 to 98°C is sufficient, but then again it goes back to the machine’s operator to adjust the temperature as needed. Additionally, the manufacturer claims that when the machine is idle or when it is on but not used, the temperature will automatically drop to 1°C. 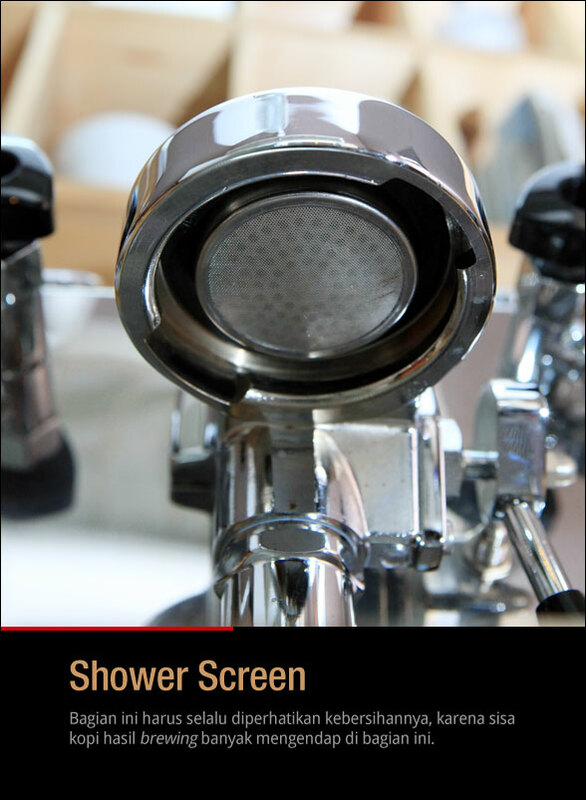 The Shower Screen. This part must always be looked after its cleanliness, since the remaining of brewed coffee usually precipitates here. For my convenience, I use the water supply from the machine’s 1.5 liter capacity water tank. Like I said before, when the water in the tank has run out, Vibiemme will automatically shut itself down to prevent overheating from the boiler due to insufficient water supply, which in turn can cause damage. If that’s the case, simply switch it on by moving the lever to the “I” position and the pump will start drawing water into the two boilers, which takes only less than a minute. To make sure that the water is in there, I lift the brewing lever and flow water into the grouphead – an initial process called priming. Next, I move the power switch lever to “II” and the heater will start working which is shown by the temperature indicator gradually increasing. It can be adjusted by pressing the “P” button. 20 minutes of all that and Vibiemme is all yours to use. Pressure Adjustment: This process requires changing the boiler pressure parameter and pump by a preinitial test using the blind filter. Check the pump and boiler pressure shown on both manometer while lifting the brewing lever. I did this with the cover open so I could access both parts from the machine – which are the pump and the P-stats. 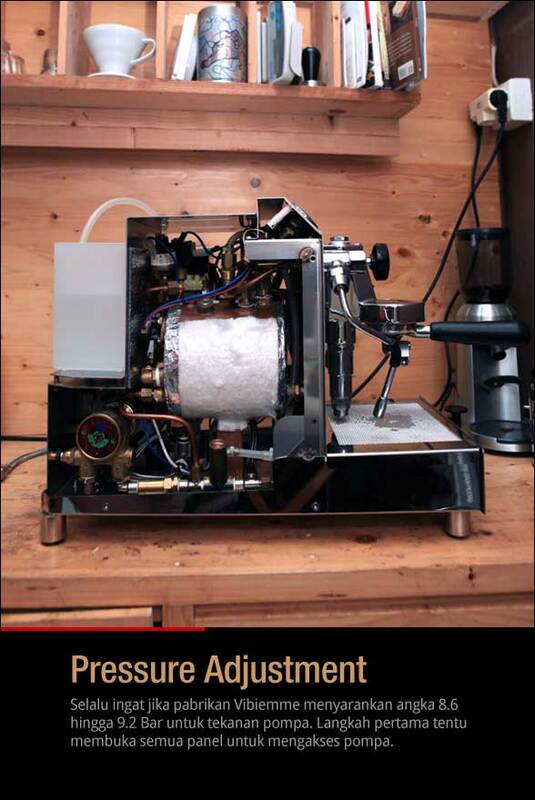 I only change the pump pressure to bar 9, a moderate number that usually works for espresso extraction especially for home appliances. 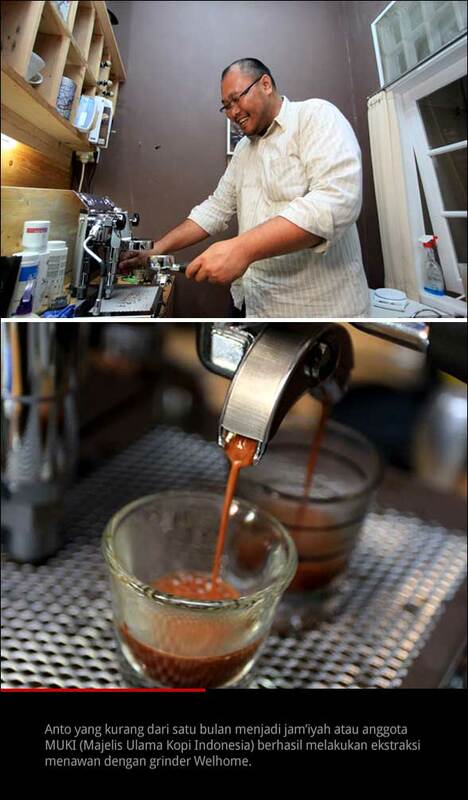 My thanks to Andy Kho who was kind enough to share his home barista knowledge while tweaking the V3 machine. Brewing: A good grinder will definitely compliment a V3, and Anfim Caimano On Demand is the brand that we chose as its partner in crime. Andy and Hideo who coincidentally brought fresh coffee with them tried VST 7 basket and 22 gram attached to Vibiemme’s portafilter. The extraction result made by two home baristas, Andy Kho and Anto who came several days later, can be seen below. 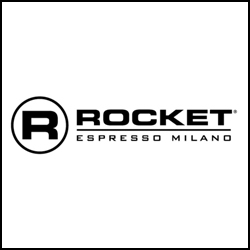 Especially for steaming, the machine – which has 2 liter boiler capacity – is able to froth with all its might within 5-7 seconds on a 300 ml pitcher. 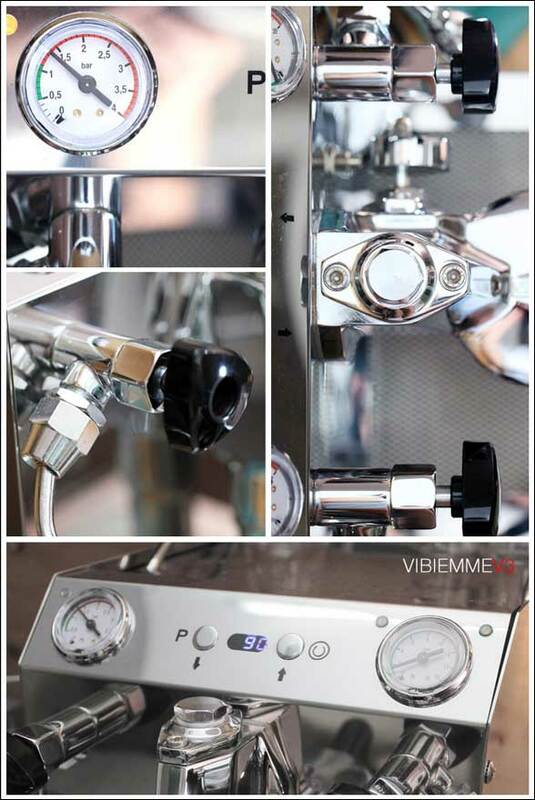 The Vibiemme V3 – just like its predecessor – is always a pleasure to use, as it is a machine that has a renowned reputation in the world of espresso machines. 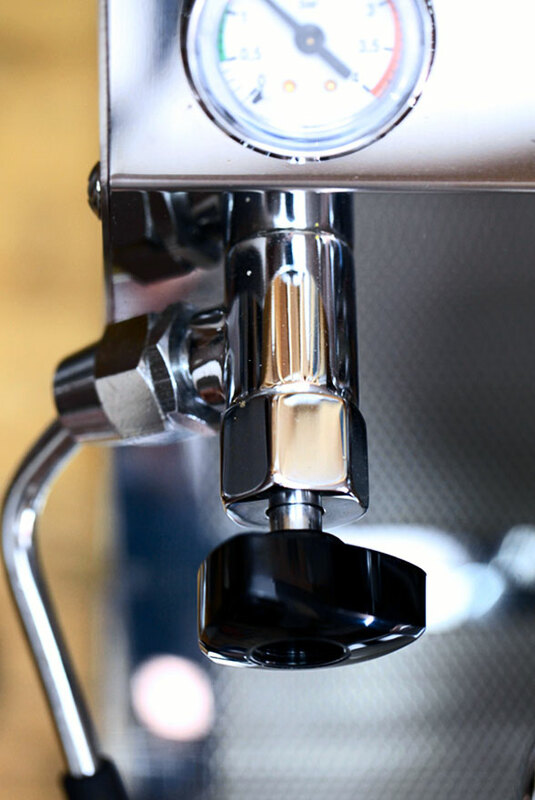 But of course, just like us humans, no machines are 100% perfect – there are always one or two things that could have been better, like the brewing lever which I personally think is too close with the E61 grouphead. Of course, you must understand that due to the limited constructions, you have to watch your hands more carefully to avoid being scalded by the hot grouphead. Every now and then, flushing must be executed, especially when the machine is idle – this is to reduce the heat accumulated within the group head. Putting all those things aside, this is basically a glance of how we use the V3 machine, and of course revisions will be added when we do find further information, along with further usage. 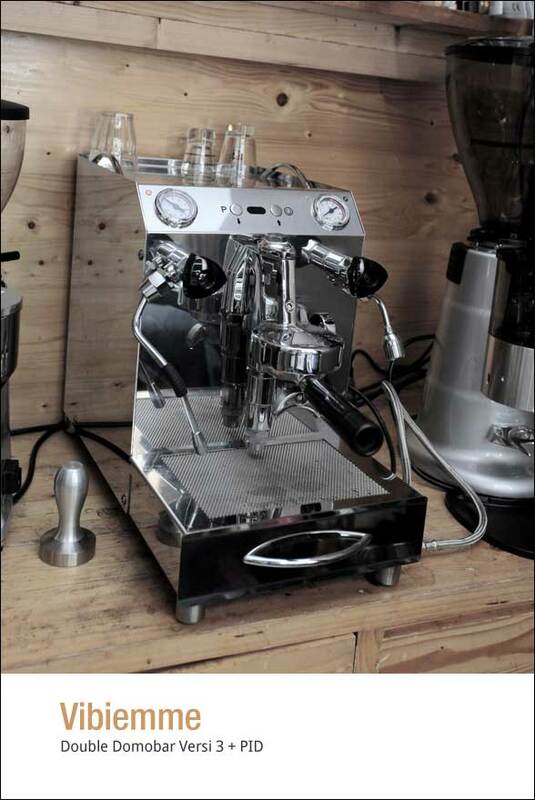 Last but not least, I would like to thank Vibiemme and Toffin for their kind attention and appreciation for Cikopi.com, and this machine will definitely be my favorite partner in crime in my coffee lab. Cheers! 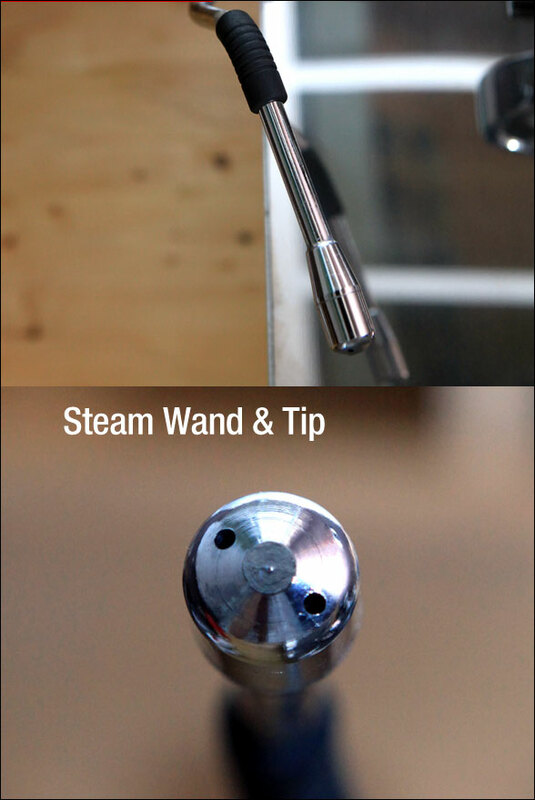 Hot water wand : When you want it hot. I rarely use this feature, but the hot water wand is a standard feature for an espresso machine. The Pressure Adjustment. Always remember that Vibiemme advises 8.6 to 9.2 bar for the pump boiler. The first step is to definitely take all the panels off to have full access to the pump. Two Water Sources. You can either get it from the left hose, or the water tank within the machine which functions can be adjusted by rotating the lever on the right. This feature is accessible at the bottom part of the machine. The Water Tank. With the capacity of 1200 ml, there’s an automatic shutdown feature, which means the machine shuts down automatically when the water supply is empty, in order to prevent damage from the heater in the boiler. The yellow tab with the plus and minus symbol on its sides is an access to change the pressure stats – or also known as the boiler pressure. The Rotary Pump. This is the heart of every espresso machine. It distributes water into the boiler and the group heads. The part highlighted in red can be tweaked to change the pump pressure. The P-Stats. The pressure stats, which is used to set the boiler pressure, can be adjusted as needed. I didn’t make any adjustment to it – 1.1 bar was powerful enough to steam milk. The Power Switch. : O = off. I = the pump fills up water, while the heating gets warmed up, II = The heater starts working inside the boiler. First, slide it to the “I” position – if the water has filled up the boiler and the pump has stopped working, slide it over to the “II” position and wait until the machine is ready to use. This is the mechanism that is meant to protect the machine from the heating element due to insufficient water supply in the boiler. The OPV – which stands for Over Pressure Valve – or as I call it, “Expansion valve” – which expels any overflowing pressure. For example if there’s any accumulated pressure on the grouphead due to over extraction (over-refined ground coffee) will be expelled from the OPV pipe with a hissing sound. This is Andy Kho’s creation, who happens to own a V3 and knows the machine so well, including its technical specification and other features not written on the manual. Semoga pembaca masih ingat bahwa dua tahun yang lalu saya pernah mempunyai mesin espresso Vibiemme yang saya unboxing di sini. Untuk kali kedua mesin dengan merek yang sama namun berbagai fitur tambahan yang nama lengkapnya : Vibiemme Double Domobar Manual Stainless Version 3 akan menjadi penghuni tetap di rumah saya. 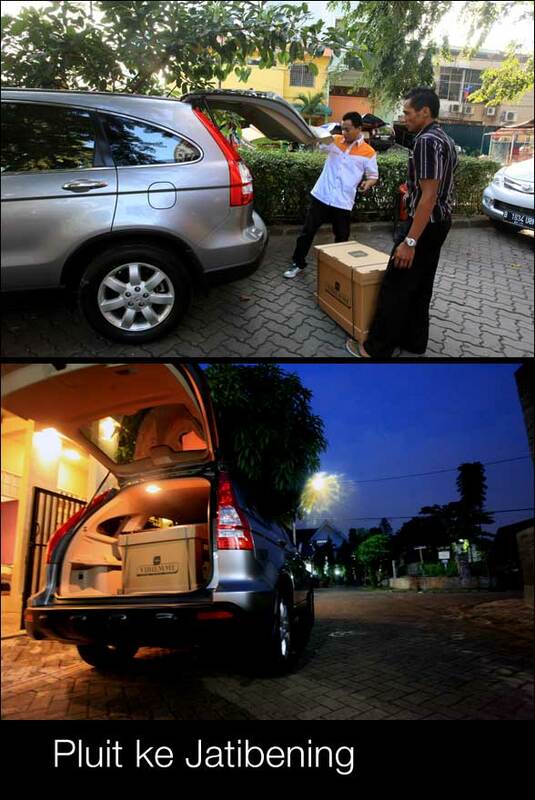 Katakanlah sebagai kado dari Vibiemme Italia dan distributornya di Indonesia Toffin akan usia blog kopi ini yang menjelang 4 tahun ! Ini versi ke-3 setelah sebelumnya Vibiemme mengeluarkan tipe yang sama yang pernah saya tulis dalam artikel dengan judul Domobar PID & Double Boiler. Jadi saya tidak akan terlalu detail mengulas kecuali beberapa perbedaan signifikan seperti penggantian pompa yang pada versi terdahulu menggunakan tipe vibrasi menjadi rotary sebagaimana yang biasa terdapat pada mesin komersial. Upgrade yang lain meliputi kemampuan versi ini untuk memilih tangki air atau sambungan langsung ke sumber air dengan perpindahan satu tuas di bagian bawah mesin. Vibiemme juga mengklaim penyempurnaan penting pada konsistensi suhu boiler dan steam yang lebih bertenaga dibanding tipe terdahulu. Rancang bangun dan desain. Desain eksterior untuk mesin Vibiemme yang biasa digunakan untuk rumahan atau hanya light commercial tak banyak berubah sejak pertama kali diperkenalkan di awal tahun 80an. Berbalut stainless yang mengkilap dengan group head legendaris tipe E61 dengan tampilan klasik yang tetap mempunyai banyak penggemar setianya. Lihatlah setiap lekuk permukaannya dari atas hingga ke bawah, attention to details, yang membuat mesin dengan group head E61 seperti tak hendak segera hilang dari jagat mesin espresso. Satu hal, Stainless memang mengkilap dan enak dipandang, tapi menyisakan sedikit ketaletenan untuk tetap membuatnya selalu berkilau. Sisa-sia air yang menempel dan lupa dibersihkan akan cepat membekas lalu membuat bercak kusam di permukaannya. Sebagaimana mobil berwana hitam metalik, bila tak rajin dipoles dengan lap microfiber, kotoran akan menjadi penghuni tetapnya. Kelengkapan : Dalam kardus Vibiemme V3 kita akan mendapatkan masing-masing satu buah portafilter single dan double, blind filter untuk keperluan backflush, sikat pembersih, tamper plastik, buku petunjuk, dan selang untuk distribusi air bersih dan kotor. 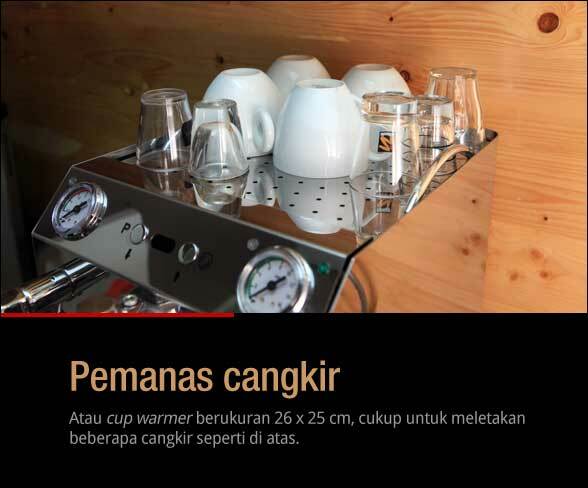 Sebagaimana biasa, sisihkan tamper plastik dan gunakan yang terbuat dari aluminum atau stainless yang bisa menekan kopi pada portafilter ukuran 58mm. Daya listrik : Mengangkat sebuah mesin yang berat total berserta kardusnya sekitar 31 kg tentu memerlukan dua orang dewasa dan harus ditempatkan pada permukaan yang rata serta kokoh. 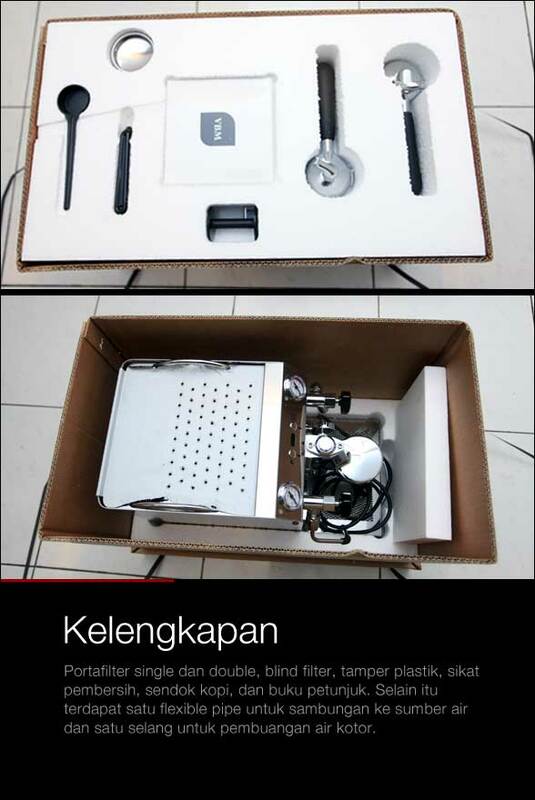 Panjangnya mencapai 53cm dengan lebar 27 cm dan tinggi 42 cm serta akan menghabiskan total daya listrik 2100 watt yang dibagi untuk brewing sebesar 900 watt dan 1100 untuk steam. Besarnya daya listrik seringkali menjadi kendala bagi para home barista yang harus menyediakan suplai listrik tambahan demi memenuhi kebutuhan mesin ini. Bagusnya tidak menggunakan sistem 3 phase, jadi pendistribusian lsitrik di rumah bisa diseimbangkan sedemikian rupa melalui miniature circuit breaker (MCB). Sebagai catatan, daya listrik yang besar pada mesin Vibiemme memerlukan peralatan yang berkualitas prima terutama untuk outlet atau sumber listrik demi keamanan dan pencegahan arus pendek. Air galon atau tangki : Penutup atau cover mesin bisa dibuka tutup untuk mengakses tangki air yang berkapasitas 1,8 liter serta satu lubang kecil untuk memasukan obeng (-) saat kita akan mengubah Pressure Stats atau tekanan di dalam boiler. Tangki air bisa dilepas bukan saja untuk kemudahan pengisian, tapi terdapat satu sekrup kecil (+) yang harus dikencangkan bila pengguna ingin mengubah sumber air ke direct plumb. Pengencangan sekrup dimaksudkan untuk mem-bypass agar fitur “automatic shutdown”, dimana saat tangki air kosong mesin secara otomatis akan mematikan sambungan ke listrik untuk melindungi kerusakan elemen pemanas di boiler karena kekurangan pasokan air. Tentu saja mesin merek lain yang tidak memiliki fitur seperti ini diharapkan untuk rajin-rajin melihat suplai air di tangki sehingga kerusakan fatal bagian penting seperti heating element bisa dihindari. Bila sudah ditutup kembali, bagian atas selalu digunakan untuk menyimpan dan menghangatkan cangkir yang dihasilkan dari udara panas boiler. Sebagai tambahan, pada beberapa mesin komersial dua group banyak digunakan sistem penghangat aktif yakni sebuah heating element ditempelkan di bawah permukaan cover-nya (Vibiemme Lollo misalnya). Cangkir yang akan digunakan memang disarankan atau lebih tepatnya diwajibkan untuk selalu hangat, setidaknya untuk mengurangi penurunan suhu kopi yang drastis akibat peralatan dingin. Panel depan : Dua manometer yang menunjukan indikator tekanan boiler (kiri) dan pompa (kanan) adalah hal penting yang harus diperhatikan setiap melakukan brewing. 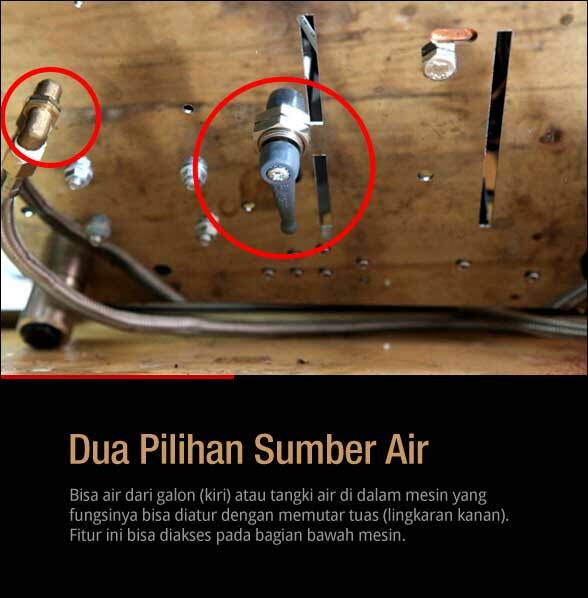 Buku petunjuk tidak memberikan berapa besar tekanan pompa dan boiler, tapi pada mesin yang saya miliki dulu, 8.6 hingga 9.2 bar adalah angka aman yang dianjurkan oleh pabrikan untuk tekanan pompa. Satu buah steam wand di bagian kanan dan steam yang bisa digerakan secara bebas dengan dua lubang ukuran 1 mm diletakan di bagian kiri. 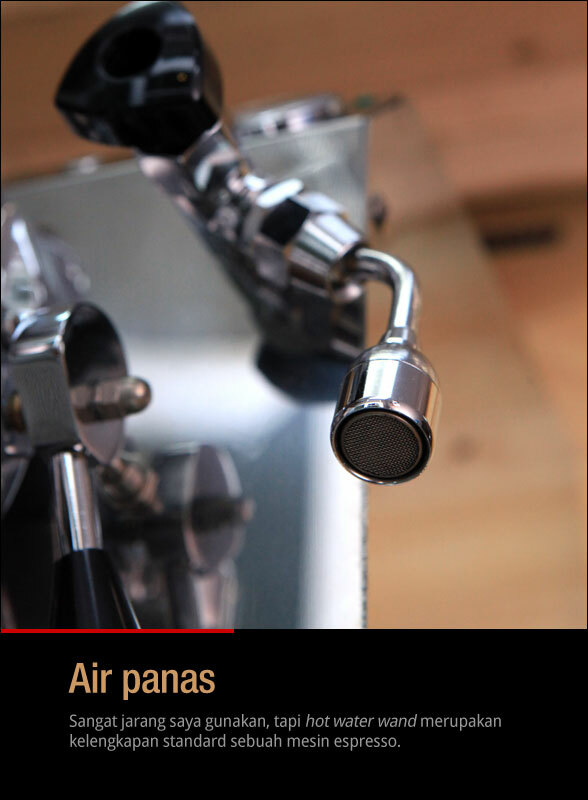 Steam wand menghasilkan panas saat mesin dioperasikan karena tidak dilengkapi dengan fitur anti burn. Tuas air panas berada di sebelah kanan yang snagat jarang saya gunakan. Dual Boiler & Pompa Rotary : Versi tiga Vibiemme dilengkapi dengan dua buah boiler masing-masing berukuran 500 ml untuk menyeduh kopi dan 1.9 liter untuk keperluan steam. Boiler diberi lapisan khusus untuk menjaga suhu air tetap stabil. 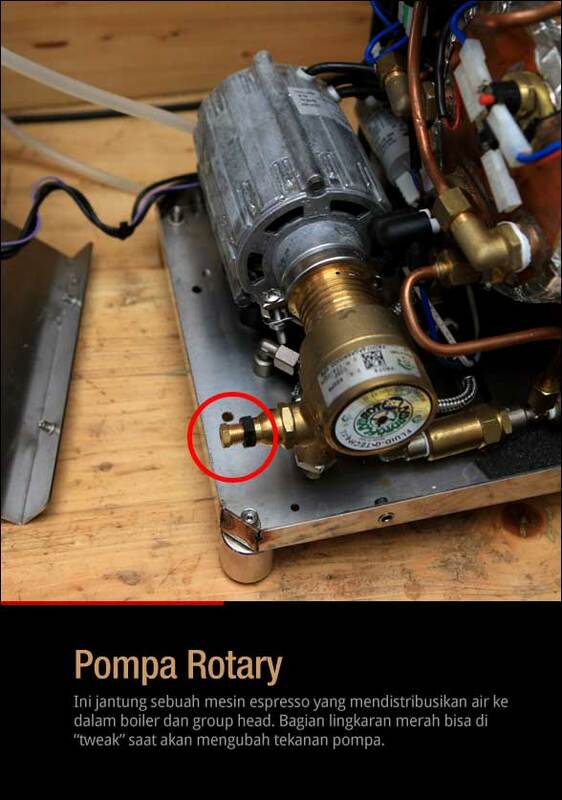 Pompa rotary terpasang di bagian belakang boiler, sebuah kelengkapan yang biasa terdapat pada mesin komersial dua group. Vibiemme dalam buku petunjuknya menyatakan bahwa pompa ini tidak didesain untuk mengalirkan air melawan gravitasi, dengan kata lain mereka ingin mengatakan agar menggunakan pompa tambahan seperti flo jet bila memanfaatkan galon air yang dipasang di bawah kabinet. PID : Nah ini fitur yang menjadi selling point Vibiemme V3, sebuah istilah yang dikenal dengan Proportional, Integral, Derivative, yang memungkinkan pengaturan suhu seduh atau brewing sesuai dengan kebutuhan pengguna. Parameter suhu bisa diubah, baik menggunakan sistem celsius atau fahrenheit dengan menekan kedua tombol pada saat mesin dalam keadaan tidak menyala. Sambil terus menekan kedua tombol, putar switch ke posisi “I” hingga display menunjukan “F.03” lalu lepaskan. Atur “C” atau “F” dengan menekan tombol pada bagian kanan, setelah selesai matikan mesin sebagai eksekusi perintah lalu nyalakan kembali. Fitur PID bisa diatur pada suhu terendah yakni 80 derajat C hingga tertinggi sebesar 125 derajat C. Berapa suhu seduh yang ideal ? Untuk saya angka 95 hingga 98 derajat C sudah cukup memadai, tapi tentu terserah kepada pengguna untuk mengatur suhu sesuai dengan kebutuhan. Sebagai tambahan, pabrikan mengklaim bahwa perubahan suhu pada saat idle atau mesin yang menyala tapi tidak dioperasikan lalu digunakan hanya berkisar 1 C.
Untuk kepraktisan saya menggunakan sumber air yang terdapat di dalam mesin dengan mengisinya sebanyak 1.5 liter. Sebagaimana yang sudah saya katakan di atas, saat air di dalam tangki kosong maka secara otomatis Vibiemme mematikan sistem kelistrikan untuk mencegak kerusakan pada bagian pemanas di dalam boiler akibat kekurangan pasokan air. Lalu tomobo power dinyalakan dengan memindahkan ke posisi “I” dan pompa mulai menarik air ke dalam dua boiler yang berlangsung kurang dari satu menit. Untuk memastikan air sudah berada di dalam boiler saya mengangkat tuas brewing dan mengalirkan air ke dalam group head untuk pertama kali, sebuah proses yang dinamakan priming. 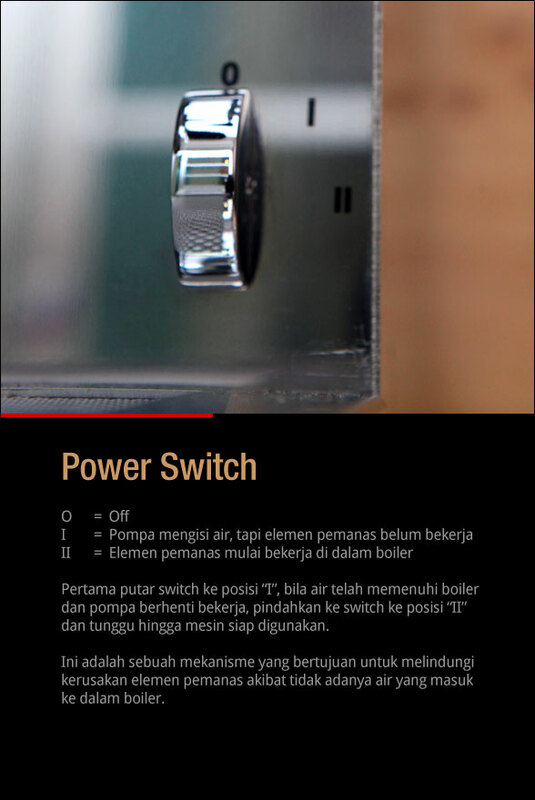 Selanjutnya pindahkan switch power ke posisi “II” dan pemanas akan mulai bekerja beserta indikator suhu yang perlahan naik sesuai dengan suhu yang bisa diatur dengan menekan tombol “P”. Hanya sekitar 20 menit Vibiemme V3 sudah siap digunakan. Pressure Adjustment : Tapi tahan dulu, bila Anda ingin melakukan pressure adjustment ini saatnya yakni mengubah parameter tekanan boiler dan pompa dengan melakukan test terlebih dahulu menggunakan blind filter. 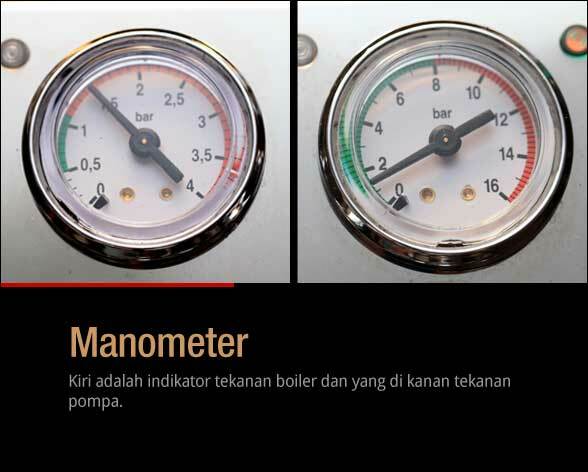 Lihat tekanan pompa dan boiler yang ditunjukan pada kedua manometer sambil mengangkat tuas brewing. Proses ini saya lakukan dengan membuka cover hingga bisa mengakses kedua bagian tersebut, yakni pada pompa dan P-Stats. 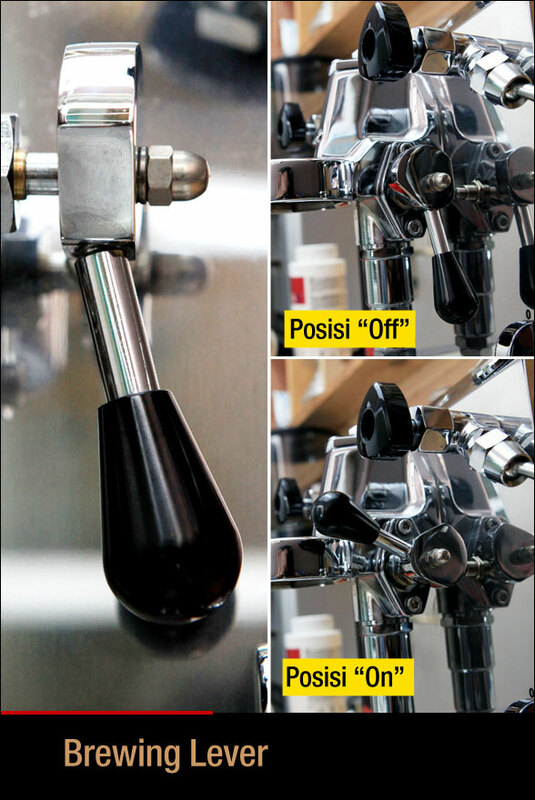 Hanya tekanan pompa yang kami ubah menjadi 9 bar, angka moderat yang biasanya tokcer untuk ekstraksi espresso pada mesin rumahan. 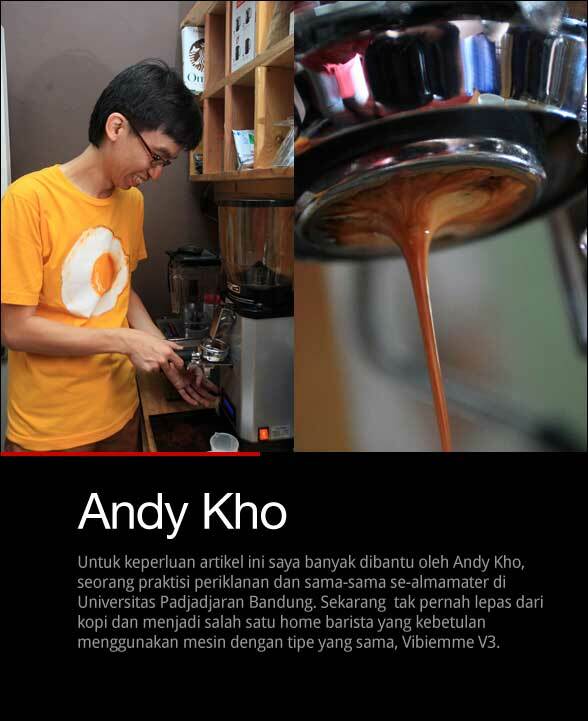 Terima kasih kepada Andy Kho yang sudah berbaik hati berbagi ilmu home barista-nya saat melakukan tweak pada mesin V3. 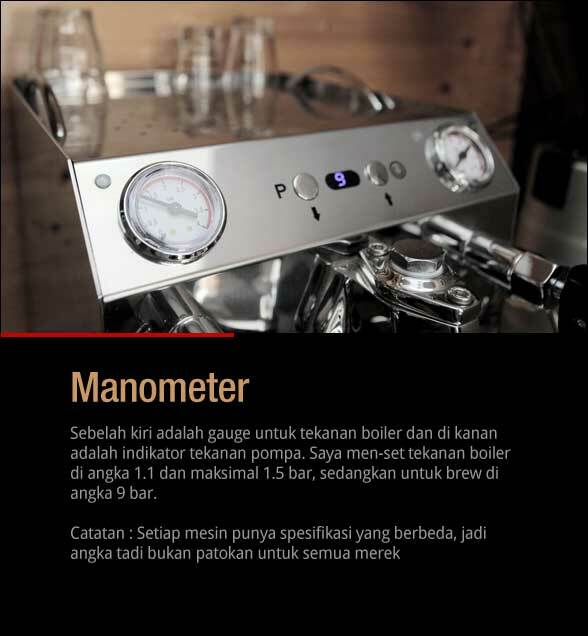 Brewing : Grinder yang baik tentu akan membuat V3 mengeluarkan segenap kemampuannya dan Anfim Caimano On Demand kami gunakan untuk mendampingin mesin ini. Andy beserta Hideo yang kebetulan membawa kopi yang masih segar bugar mencoba basket VST 7 dan 22 gram yang dipasangkan pada portafilter Vibiemme. Hasil ekstraksinya bisa Anda lihat di bawah dari dua orang home barista Andy Kho dan Anto yang datang beberapa hari kemudian. 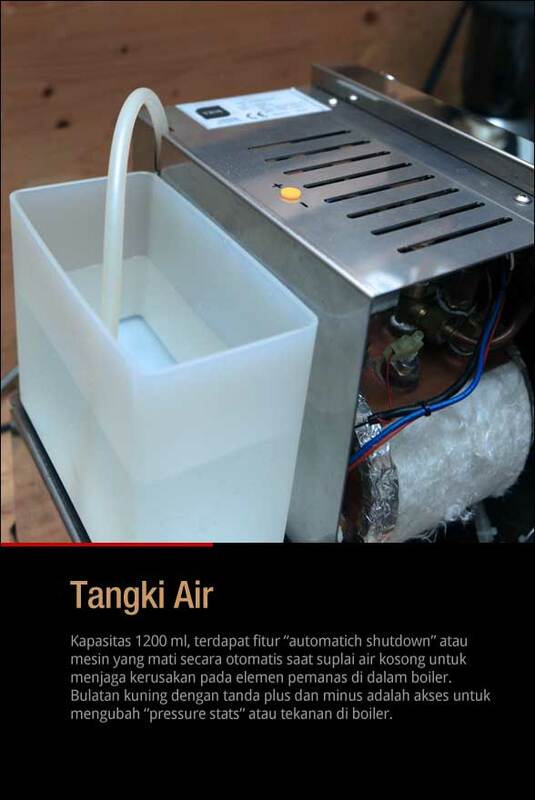 Khusus untuk steam, mesin dengan boiler hampir dua liter ini mampu memuntahkan tenaganya untuk mem-frothing hanya dalam hitungan 5-7 detik saja pada pitcher ukuran 300 ml. Vibiemme V3 sebagaimana versi sebelumnya selalu menyenangkan untuk digunakan, sebuah mesin yang sudah punya reputasi di dunia mesin espresso. Tapi tentu tak ada mesin yang sempurna, selalu saja ada hal yang seringkali membuat greget, seperti kedudukan tuas brewing yang sangat berdekatan dengan group head E61. Tentu dimaklumi karena konstruksi yang terbatas membuat tangan kita harus hati-hati agar tidak disapa group head yang panas. Sesekali flush perlu dilakukan terutama pada saat mesin idle untuk membuang panas yang terakumulasi di group head. Terlepas dari itu, ini hanyalah sekilas pandang bagaimana kami menggunakan mesin V3 dan akan direvisi bila menemukan hal-hal baru lainnya. Terakhir, terima kasih Vibiemme dan Toffin atas perhatian dan apresiasinya terhadap blog cikopi dan mesin ini akan menjadi pendamping setia di dapur kopi saya. Salam ! Bisa info no telp utk service vbm machine? Gak dijual atuh, entar saya pake apa ? Mas Toni, bisa tolong ulaskan pengalaman Mas dengan mesin ini setelah pemakaian lebih dari setahun? Terima kasih. Hi, guys. 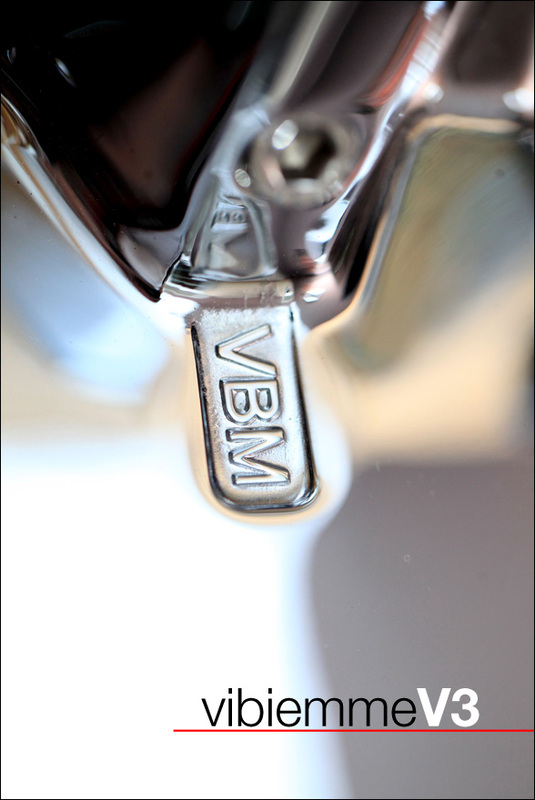 I am from Manila, and I just got my own VBM, so terima kasih for your excellent photos. 4) And the real OPV (aka the pressure relief valve) is actually in line with the rotary pump, which releases excess brew boiler pressure into the drip tray, via a horizontal nozzle. I learned these things just hours ago, when I tried to tweak my brew boiler from 8 to 9 BAR, steam boiler from 1.5 to 1.1 BAR, and the safety OPV to about 14 BAR. Hope this helps. It may keep your readers from tweaking the wrong controls! Vivaldi si merah kmana ya? ?koq gak kliatan?? akhirnya masuk cikopi jg,setelah sempet heboh di SCAK.. btw brati bro andy tu jipet ya? Pake flash biasa aja sih. Monggo mampir. VST pullmann nya sudah dateng booossss? Waduh kang, belum resmi ini kalo saya can ka imah kang Toni mah wkwkwkwk! Padahal kemarin cuma berniat oprek grinder bareng pak Toni..
eeeh kepancing buat nyobain mainan barunya pak Toni : Vibiemme V3 ! Jadilah home barista amatiran.. hehehe..
Percobaan ketiga barulah berhasil untuk double shot..
Ga menyesal milih V3. Setelah beberapa bulan membanding2kan beberapa kandidat mesin dari segi fitur dan harga, saya pinang ‘neng Fitri’ yang menurut penilaian saat itu paling kompetitif. PID, dan akses yang mudah ke pressure adjustment, membuat belajar ilmu hitam jadi lebih mudah & eksperimental. Terima kasih kang Toni, Cikopi, Toffin, bung HK, Charlie, & semua teman2 yang menyesatkan saya disini, sampai sengaja lupa jalan kembali… >_<"